Measurements: 3.55 x 5.05 inches, or 90 x 128 mm. Wide. Back of card: A field of green, shading to blue (top to bottom), with two large leaves radiating from the center. Can be inverted if the green to blue background doesn't bother you. Booklet included: Yes, 74 pages, 3.5 x 4.85 inches, or 88 x 123 mm. Comments: Not a tarot deck, there are no suits nor major/minor arcanas nor face cards nor pips. There are, instead, 32 pretty pictures of flowers & what might well be described as flower fairies enjoying them. In the booklet they are called archetypal companions, which is about the same thing. 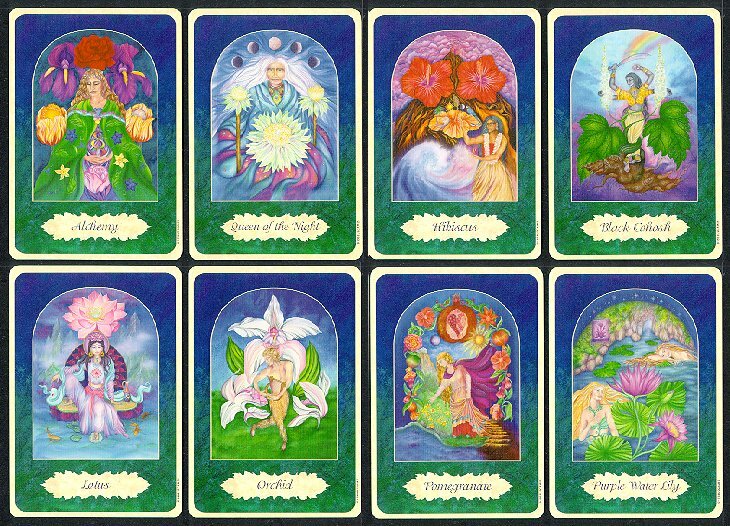 From the introduction: "The Power of Flowers cards were inspired by extensive work with flower essences, astrology, tarot, alchemy, gardening, folklore and mystical studies. In addition, my time at The Findhorn Foundation, from 1976 to 1980, was a precious opportunity to explore the soul connection between human beings and nature. Working in the Findhorn gardens, I knew that one day I would find a way to share my own intimate experience of the wonders of I had discovered there..." - Isa Lerner. It's worth remembering that Findhorn has been an incubator for many and varied new age thinkers, many of whom have brought us the most wonderful gifts. It's also sobering to realize that Findhorn itself is located on the north coast of Scotland where it's always cold, the sunshine of the summer days, though long, is also weak, and the soil is poor & sandy. Fertile valleys in Alaska grow giant vegetables. Findhorn is, on the face of it, much less hospitable. There are two layouts suggested in the booklet: The Garden layout, where you pick one flower from the entire garden (cards fanned, face up), and the Flower Speaks layout. For this, all 32 cards are used. Spread all the cards in a circle (representing the womb). From these, pick four cards to represent the letters L O V E. Place these face down in the center of the circle & turn them over one at a time. L represents Life, O is Open Channel, V is Victory, E is Eternity. 1. True, without deceit, certain and most true. 2. What is below, is like what is above, and what is above is like that which is below, for the performing of the marvels of the One. 3. And as all things proceed from the One, through the meditation of the One; so all things proceed from this one thing, by adaptation. 4. Its father is the Sun, its mother is the Moon; the wind hath carried it in its belly; its nurse is the Earth. 5. This is the father of all perfection of the whole world. 6. Its power is complete when it is turned towards the earth. 7. You shall separate the earth from the fire, the subtle from the gross, smoothly and with great cleverness. 8. It ascends from earth to heaven, and descends again to the earth, and receives the power of the higher and lower things. So shall you have the glory of the whole world. So shall all the obscurity yield before thee. 9. This is the strong fortitude of all fortitude: because it will overcome every subtle thing and penetrate every solid. 10. Thus was the world created. 11. Hence will there be marvelous adaptations, of which this is the means. 12. And so I am called Hermes Trismegistus, having three parts of the philosophy of the whole world. 13. What I have said concerning the operation of the Sun is finished.